Most new homeschool moms choose a homeschool curriculum based on their children’s learning style, but forget that they are a vital part of the homeschool approach, vision and energy. Your homeschool style is how you naturally approach homeschooling. If you choose a style that doesn’t suit you, you may find yourself becoming anxious, stressed, fearful, negative, bored, confused, scattered, or even burnt-out! When parents follow a homeschool style that is a good fit with their unique attitudes, values, vision and passion, homeschooling becomes an exciting journey with their children. For example – a mom who loves the idea of project-based learning, but hates a messy house will begin to quench the natural flow of hands-on activities. A mom who wants her children to learn “naturally” will become utterly frustrated by a curriculum that is highly scheduled with tests, workbooks and exams. A Unschooling approach may make a mom nervous about not covering all the subjects and skills she feels need to be covered daily. Many moms that do not want to be involved in teaching every lesson and prefer independent-type lessons may become exhausted by an approach that requires intensive parent-led involvement. Parents often choose out of fear! Some choose a school-at-home-approach with the aim of keeping in line with traditional schooling in case homeschooling “fails” and their child has to return to school. These parents hardly ever discover the joys of following a homeschooling style that is filled with excitement, involvement, vision and enthusiasm. Many new moms chose a detailed, scheduled curriculum designed by professionals because they feel unsure as their child’s educator, but learn through time, that they can build their own curriculum designed for their family that fits perfectly. Many parents use multiple approaches. Your homeschooling may shift and change as your children mature and as your experiences redefines what works. This is normal, so don’t feel guilty about not being a purist! Find what works for you and each child and aim to become their facilitator and inspiration while remaining energized, passionate and involved. 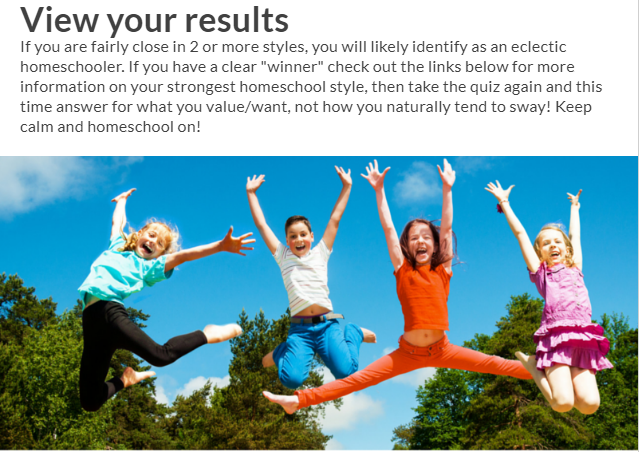 By taking a simple quiz, you can discern your dominant homeschool style and these results can help you tweak your approach to be more of what you want. A quiz helps to analyze what is working and what isn’t, to think about your values and goals and if your approach is facilitating that or working against it. Has taking these types of quizzes helped you in your homeschooling? Please share with the readers in the comments below.